NFL.COM: Killer Bees Are Best Trio In The League | "IT'S A STEELERS WORLD"! Uhhh..no duh. NFL.com is actually telling us something that we agree with and have known since last season. But hey..better late to the party than not showing up at all, right? “Over the last two seasons, Brown has been, at worst, the second-best WR in the NFL (239 receptions!). In 2014, Bell was, at worst, the second-best RB, while Roethlisberger had, at worst, the third-best season among QBs. Add ’em all up, and it’s tough to argue anything other than this trio* being, at worst, the best”. What? This coming from a league that seems to ride more ‘Patriot P****’ (I’ll let you fill in the blanks) than any other team? The hell you say. But it’s about time that they got something correct. Granted, the Steelers did not bode to well with Le’Veon Bell missing from the lineup in January’s wildcard game versus the Baltimore Ravens, but that is why it is called a trio..or ‘triplets’ as NFL.com so eloquently put it. Because these three..trio..triplets..are in fact unstoppable. 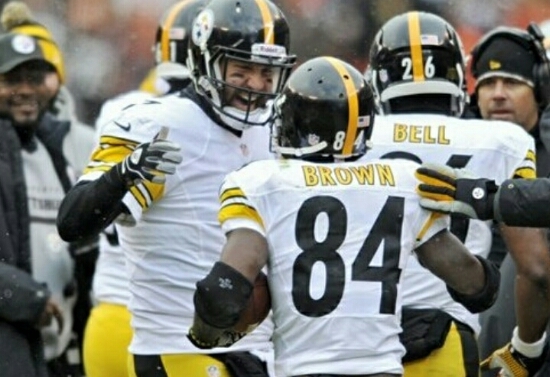 With Big Ben entering his glory years, still surpassing younger quarterbacks..Brown doing what he has convincingly done since stepping into the #1 receiver slot after being drafted as the 195th pick of the 2010 NFL draft..and Bell, who is basically just learning to walk in this league, one can only fathom what is to come. Super Bowl victory #7 perhaps? Yep! Anyway, as Jeff Hartman from ‘Behind The Steel Curtain’ stated.. So I honestly ask you this. Which trio is better? I dare you to come up with a viable response to that question.